MISSION, KS--(Marketwired - Nov 20, 2014) - (Family Features) When it comes to holiday gift giving, you can't go wrong with clever gifts that promote unwinding with friends and family. The following gift ideas are perfect for entertainers, tailgaters, wine enthusiasts, craft beer fanatics and more. So go ahead, spread some holiday cheer with one of these hot, new gift ideas -- all affordably priced under $50 each. Give your family and friends unique, affordable gifts that help them celebrate not just the holiday season, but all year long. Want to please the partygoer this season? Give them govino shatterproof, reusable and recyclable glasses. Perfect for parties on the patio, by the pool and, of course, indoors. From wine to cocktails to beer, govino's unique, patented, ergonomic thumb-notch lets party animals toast and cheer with ease. Available in four sizes, govino glasses ($14.95 for a set of four) add an elegant touch to any occasion -- without the worry of broken glass. So, raise a glass to the season and visit www.govino.com. Make outstanding craft beer right out of the box with this beer brewing kit from Craft a Brew. Simply and easily brew fresh craft beer at home in your own kitchen. These brewing kits come in nine different beer styles of your choice from American Pale Ale to Chocolate Milk Stout. Starting at just $45, this gift will bring many cheers to the home. To learn more about crafting delicious beers at home, visit www.craftabrew.com. 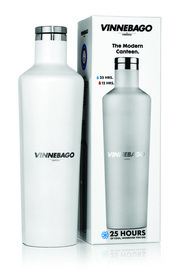 Vinnebago by Corkcicle is the ideal gift for those who want to take beverages on the go -- cold or hot. Simply pour your favorite drink into Vinnebago ($30) at the temperature you'd like to keep it, and Vinnebago will keep it cool for 25 hours or hot for 12 hours. No bottle sweat, no pre-freezing required and no breakable glass. Toast the holidays on a boat, beach, ski slope or wherever. For more ways to celebrate at the perfect temperature, visit www.corkcicle.com. Rewined candles are handcrafted in Charleston, South Carolina from repurposed wine bottles using premium natural soy wax. Whether you're a red or white wine lover, each of Rewined's fragrance varieties are blended to mimic the tasting notes and aromas found in your favorite wine varietal. Need another reason to raise your glass and cheers? Each candle ($28) is packaged in a reusable drawstring bag perfect for gifting. It just may be the best smelling gift you've given. For more gift ideas to light up the holiday season, visit www.rewinedcandles.com. Give the gift of cold beer. Chillsner ($29.95 for a set of two) is the first and only, in-bottle beer chiller that keeps cold beer cold from the first sip to the last, whether drinking from the bottle or as you pour into your glass. Just freeze, insert into any bottled beer, and drink right through the Chillsner. It is a must-have gadget for any beer drinker. Perfect for parties, tailgating or anywhere beers are enjoyed. To learn more about this cool gift, visit www.corkcicle.com.